Professional wrestling (often shortened pro wrestling, or simply wrestling) is a mode of spectacle which combines athletics and theatrical performance. It takes the form of events, held by touring companies, which mimic a title match combat sport. The unique form of sport portrayed is fundamentally based on classical and "catch" wrestling, with modern additions of striking attacks, strength-based holds and throws, and acrobatic maneuvers; much of these derive from the influence of various international martial arts. An additional aspect of combat with improvised weaponry is sometimes included to varying degrees. The matches have predetermined outcomes in order to heighten entertainment value, and all combative maneuvers are executed with the full cooperation of those involved and carefully performed in specific manners intended to lessen the chance of actual injury. These facts were once kept highly secretive but are now a widely accepted open secret. By and large, the true nature of the performance is not discussed by the performing company in order to sustain and promote the willing suspension of disbelief for the audience by maintaining an aura of verisimilitude. Wrestling is fake. I'm sorry to break that to folks. It's improvisational fiction performed by well trained athletes. And my apologies to Matt Hickman, who will likely find fault with this blog, but I did try to get you to write one for three years. So since wrestling is fictional, it counts just like any other work of fiction when making crossover connections. And wrestling has lots of crossovers. Many fictional characters have appeared in professional wrestling programs, and wrestlers appear on other shows, most times staying in character. Wrestlers also appear often on talk shows and other reality programs, again, staying in character. These instances still count as fiction under the same rules as when characters like Kermit the Frog, Borat, or Ron Burgundy show up on talk shows. Incidentally, I don't really differentiate between the various wrestling shows, or brand names. The wrestlers seem to hop from one to the other with such frequency, it's hard to keep track. I myself was once a huge wrestling fan from around 1985 - 1988 then again from 1995 - 1998. But since, I've really lost track of who's who. Come join the discussion about wrestling or other TVCU related topics here. 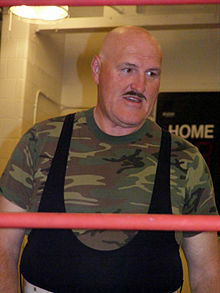 Late 1970s to Early 1990s--WWF WRESTLING--Robert Remus, code name Sgt. Slaughter, is a professional wrestler when not training Joes. (ROCKY Balboa also trains Joes as part of his Reserves duties when not boxing.) Note that during wrestling events, Slaughter proudly proclaims his status as a member of G.I. Joe. March 1984 to March 1986--WWF CHAMPIONSHIP WRESTLING--Mr. T has a career as a professional wrestler in a world where wrestling is real. October 1984--WORLD PRO WRESTLING--Mr. T appears as a wrestler. November 1985--THE A-TEAM--"Body Slam"--This episode reveals that Hulk Hogan fought in Vietnam and was friends with B.A. Note that I feel this a crossover that brings in the WWF. Wrestling is fake, and thus it's fiction. So in the TVCU, it's all real. October 1994--HALLOWEEN HAVOC--Mr. T is a special guest referee at a wrestling match. April 2001--THE SIMPSONS: WRESTLING--Leela and Bender are pulled back via the Anomaly and end up in Kang's arena. November 19, 2001--WWF RAW--Hopefully he wasn't wrestling, but this was an era when many senior citizens were still wrestling. April 2012--WWE RAW--The Three New Stooges (sons of the immortals) find their way on the wrestling show and Kane (the wrestler, not the immortal....I think) beats up Curly. And here's wrestling in Toobworld. During the ECW invasion storyline in 1997, Jerry Lawler appeared on ECW programming despite being contracted by the WWE. It was actually a work, as Vince had actually been attempting to help ECW be recognized, with Paul Heyman making several appearances on Raw during the angle. Perhaps the most well known crossover in wrestling happened on the last episode of WCW Monday Nitro, March 26, 2001. After Vince McMahon's purchase of the promotion, a simulcast was scheduled, with Vince on Raw bragging about how he bought his competition, while Nitro featured the WCW talent wrestling for perhaps their last time on television. The final minutes, however, proved to be the most memorable. On Nitro, Shane McMahon made an appearance on Nitro (in Panama City, FL), while Vince was at the Raw location (in Cleveland, OH). The titantron showed Shane on Raw, while Nitro had its Nitrovision show Vince. The segment was to begin the invasion storyline (and that, in kayfabe, that Shane was the actual owner). It was memorable in that both TNT and TNN were basically broadcasting the same thing during those final ten minutes or so, but in different settings. Here are some of the more recent posts regarding wrestling in the TVCU discussion forum. HCU Comments: This is the Mexican soul clone who is taking over Mexico. In theory, Dracula has created several soul clones that each have assigned areas of the world to conquer. This version is brought in through a later cross with El Hombre Lobo. El Santo is a real life Mexican wrestler, but his persona has appeared in a fictional film series, and indeed even his real life identity is pretty fictional. HCU Comments: El Santo and Blue Demon are real life Mexican wrestlers, who have had their own film series. Thus, these are fictional characters. And let’s face it, all wrestlers are fictional characters anyways. This is the Mexican film version of Dracula, who is likely a soul clone of the real Count Dracula. This Hombre Lobo is not the same Daninsky from the El Hombre Lobo series, but this is still part of the same series in my opinion.